Like many millennials, Alexandria Ocasio-Cortez, 29, cannot afford to pay the rent in Washington, D.C. But Ocasio-Cortez isn't your average twenty-something. The New Yorker was just elected to the U.S. Congress, where she will earn an annual salary of $174,000. But that money won't start coming in until she takes office in Washington this January. In the meantime, Ocasio-Cortez told The New York Times she hopes her savings will tide her over for the next three months. The challenges facing Ocasio-Cortez, who will represent New York's 14th Congressional district, are perhaps even greater than for other people her age because members of Congress are required to maintain a residence in their home district or state, which means Ocasio-Cortez will have to bear the expense of having two separate homes. Rising costs are bound to make this housing requirement even more challenging. 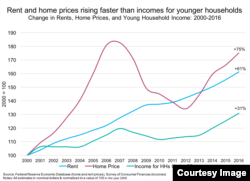 Rent has increased 61 percent over the past 18 years, but incomes for younger Americans have only gone up 31 percent, according to Apartment List. A study released earlier this year by the real estate website, which identifies millennials as people born between 1982 and 2004, analyzed the data of more than 13,000 respondents in that age group. Almost 8 percent of non-student millennials rely on financial help from family to cover their rents, according to the study. And another 17 percent expect family to help them with a down payment for a house whenever they decide to buy. 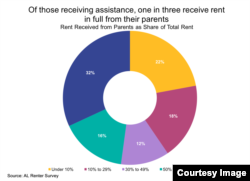 The respondents who say they receive rent assistance from their parents include nurses, teachers, receptionists and cashiers, while some are unemployed. Rents are up year-over-year in most of the country's largest markets. Rents have increased in 83 of the 100 largest U.S. cities over the past twelve months. The average cost to rent a one-bedroom apartment in Washington, D.C. is $1,343. About 7 percent of millennials currently living in the nation's capital rely on financial help from their parents to get by. When Ocasio-Cortez moves to Washington, her congressional salary, which will be more than three times the national average, could help take some of the sting out of her job-related relocation.